●What nostalgic memories do you recollect most about growing up in shitamachi? One of my dearest memories is of taking a long walk to a nearby town called Shibamata with my grandma. I used to love to go there, because the Taishakuten Temple is there, and lots of shops and eateries alongside the street leading up to the Temple. It is just like Senso-Ji Temple and Nakamise in Asakusa, only much smaller in scale and a lot homier. I would look forward to eating goodies from the shops. 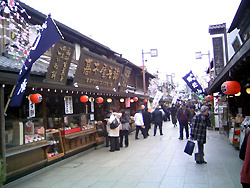 The whole area is lively and exciting with down-to-earth shitamachi style hospitality. It looked to me as if Taishakuten and the little street celebrated Ennichi every day. ●Would you say that the personalities of Shitamachi families are quite different to those of the regular Tokyoites that you knew? I think there are distinctive differences between Downtown and Uptown Tokyoites. The biggest difference is our boundary-less life style as compared to the keep-adequate-distance life style of Uptown, so to say. As you can grasp a glimpse of the world of Shitamachi though the series of Tora-san movies, our boundary towards our immediate neighbors is pretty loose. Also we are closely knit. Everybody helps everybody, gossips, mourns and rejoices together to the level of almost invading others’ privacy. ●What was your Ennichi like? My grandma told me that Ennnichi of the Shibamata Taishakuten is held on the day of the Monkey, because the Temple honors the Monkey God. So any other temple has its own Ennichi. 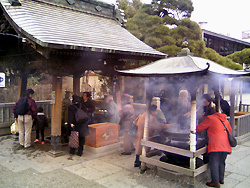 It is said that if you go to temple on its Ennichi day to pray, redemption is twice as big. I don’t know much about Ennichi’s historical and religious background, and it looks to me that Ennichi and festival are virtually the same. Whether it is Ennichi or festival, I sure was looking forward to go every chance I got. 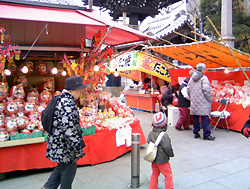 There were a lot of peddlers selling foods hot and cold, such as yakisoba (Fried Noodle), Kakigori (Shave Ice), a variety of games, masks and toys. My favorite was always Mizuame (sticky candy containing an apricot inside) and cotton candy. I usually wore Yukata (summer kimono) and danced Bon Dance in a circle with my friends and family. It was a lively occasion filled with fun and excitement. ●Did Shibamata become a tourist attraction due to Tora-san’s popularity? Yes, definitely. Tora-san has been an unlikely ambassador of Shitamachi. As the Tora-san movie series has ended, Shibamata’s popularity has also started declining. I don’t care whether it is popular or not, Shibamata always lives in my mind as one of my dearest places in Tokyo.